Home / All Blogs / Looking to Keep Your Feet Warm This Year? It’s important to keep feet dry and warm throughout the winter season – and it’s easy to do so with socks. But if you look around the city, not everyone feels as warm and cozy, nor do they have the essentials they need, such as socks. Donating old and quite worn-out garments may be a temporary solution to the homeless situation, but if your goal is to help your local community’s homeless population, it’s best to equip them with new, high-quality, but affordable essentials such as socks. Wholesale suppliers, like Bargains Group offer many affordable high-quality products to choose from and donate in Ontario. Families can buy wholesale socks at an amazing discount, to help keep their feet warm and cozy during the cold, and share the feeling with those who need it most. Bargains Group supplies wholesale socks throughout Ontario at an affordable discount price. Purchasing from Bargains Group helps you beat regular retail pricing by buying in bulk. With high-quality socks and low cost price tags, Bargains Group is the best option within your budget. Investing in wholesale products from Bargains Group, Canada’s favourite, high-quality wholesale product supplier in Ontario, is always a good investment that will surely help you save this year. Think about socks for a brief moment. You probably have more than one pair that’s cozy, dry, warm and make your feet feel good, but as soon as your toes poke through the fabric, you throw them out! For many of us, socks are disposable and easily replaceable. However, for the less fortunate, socks are an important and versatile item crucial to making it through the winter. For the homeless, socks are not just used to keep their feet warm and dry; they can also be used as mittens to keep their hands warm throughout the winter season. Good as gold and never taken for granted. Unfortunately, pervasive myths that paint people experiencing poverty and homelessness as being lazy, financially inept, and overly indulgent have caused many of us to ignore the needs of the less fortunate. Since many people can’t relate to homelessness, the myth that homelessness is due to poor character, rather than unfortunate circumstances, is easily believed. However, when we recognize that the homeless require basic necessities – food, shelter and clothing (like socks for example) – we acknowledge their humanity. We acknowledge they are people just like us with basic needs that we often take for granted. We can all help each other by buying the simple accessories we can afford and giving them out to the homeless, families, co-workers, employees or anyone in need. Bargains Group exists for this reason; to share affordable essentials we all can benefit from and supply to the less fortunate across. Bargains Group is Ontario’s wholesale supplier that delivers high-quality socks to companies, individuals and not-for profit organizations to help make the winter warmer and everyone’s feet feeling good again! Remember those less fortunate are people too that have basic needs this winter. Buying our socks in bulk gives you the opportunity to beat retailers’ overpriced socks, while being able to extend a helping hand to those who need it most, without hurting your wallet. 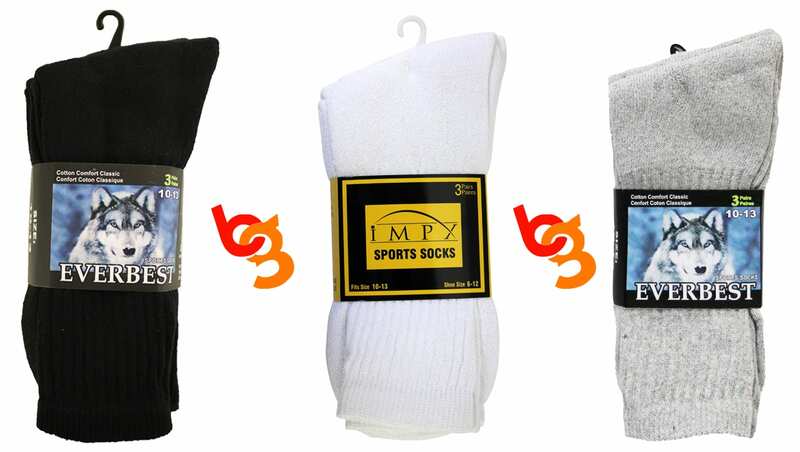 Bargains Group offers great discounts and affordable prices on bulk socks. Browse our selection of wholesale socks online, or call us toll free at 1-877-868-5655 for further inquiries on orders.